To set the default colours for tables in the Floor Plan or Table Plan panes click on the Colours and fonts button at the top of the pane. You can also set each table to have a different solid colour, gradient or texture different to the default colour. This can improve the aesthetics and allow you to easily identify different table types in your floor plan. 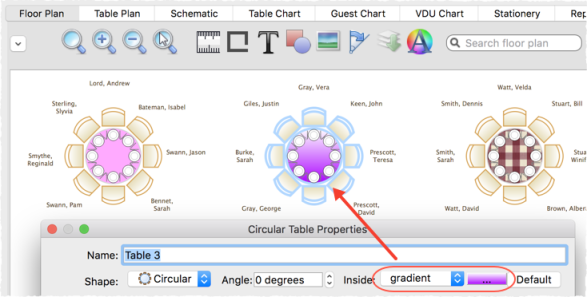 1.Double-click on a table or row of seats to show the Table properties window. 2.Choose solid, gradient or texture from the drop-down list and set the appropriate colour or texture. 1.Select the tables you wish to change in the Floor Plan or Schematic pane. 3.Change the colour in the Edit Table Colour window. 1.Select the tables you wish to change. 3.Choose solid, gradient or texture from the drop-down list and set the appropriate colour or texture.